The Chilcoot Ballroom is the ideal Okanagan Valley location for weddings of 80 to 220 people. This classic, lovely space creates the perfect backdrop for your mountainside wedding reception. 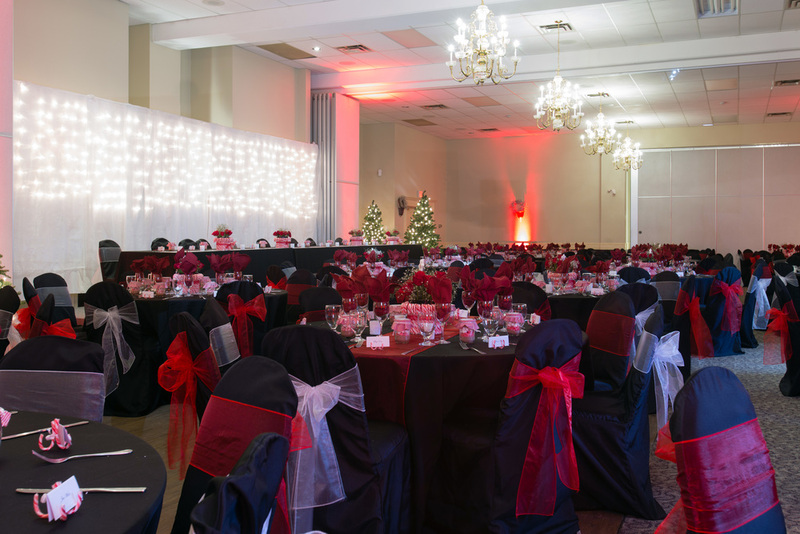 The Chilcoot Pre-Function Lobby is included with the rental of the Ballroom and all food and beverage is catered by 1609 Restaurant & Lounge. The Ballroom is typically set up in rounds of 8 with a head table on risers. A dance floor and a house system for an iPod is available for you and your guests. You are welcome to hire a DJ or band to play for your dance. Cost to rent the Ballroom is $1200.00 per day (8:00am-1:00am) which includes set up of tables, chairs, glassware, cutlery and dance floor. A microphone, podium and large wall screen are provided at no charge. 1609 Restaurant & Lounge in the Vance Creek Hotel is the perfect spot for a wedding of up to 120. This mountain venue is on the main floor of Vance Creek hotel with windows overlooking Silver Star Village and the Monashee Mountains. Cost to rent 1609 is $1200.00 per day (8:00am-1:00am) which includes set up of the tables, chairs, glassware, cutlery and dance floor. Stay on location for your wedding day. Vance Creek Hotel & Conference Centre offers a wide variety of one and two bedroom suites plus contemporary hotel rooms to accommodate your wedding party and guests. Be sure to ask about our Vacation Homes as well as our special Group Rates. As a special offer, the Vance Creek Hotel & Conference Centre invites the bride and groom to spend their wedding night in a complimentary one bedroom suite in the Chilcoot Lodge. The suite has a queen bed, full kitchen and a fireplace to relax in front of after your celebration! In addition, the Vance Creek Hotel & Conference Centre staff will provide assistance in recommending photographers, D.J. 's, entertainment, florists, event rentals, and professional bakers. We are here to help so please do not hesitate to call.